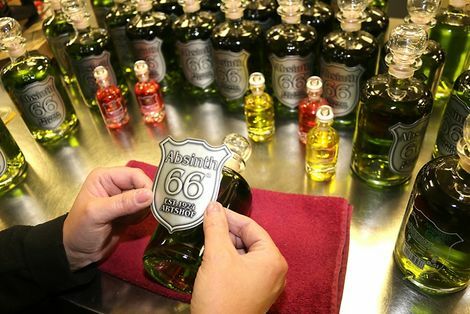 The “Absinth 66” bottles are turned into unique items by hand in the specialist factory of the “Abtshof” distillery in Magdeburg. Did the painter Vincent van Gogh lose his right ear in an argument with Paul Gauguin? Or did he cut it off himself while intoxicated with absinthe? Helmut Mager has tracked down all the publications he can find about this legendary incident at Christmas 1888 in Southern France. Mager is the company spokesman of the speciality distillery “Abtshof” in Magdeburg. Its house brand “Absinth 66” feeds on the myth surrounding the spirit, which is named after the botanical term for wormwood: artemisia absinthium. Herbal liquors and bitter, Goldbrand, clear spirits and vodka – that “Abtshof” specialities from Saxony-Anhalt are now established throughout Germany on the shelves of specialist shops and large chains is the result of a successful company strategy: “We keep a close watch on the different generations, to learn what their lifestyles are, to what extent life habits are enduring or changing,” says Helmut Mager. This is one of the reasons why the old-established business in Magdeburg opens its doors to the public. Guided tours of the business and pleasure evenings are among the options offered to visitors under the slogan “Experience culture and tradition”. The “green hour”, based on the “heure verte”, is very popular. In the second half of the 19th century, it was fashionable in French street cafés to drink absinthe between 5 and 7 in the evening, even among women. Helmut Mager opens the door to a special part of the “Abtshof” – the “Specialities Factory”. Here we meet Frank Kwapulinski, the Managing Director for Production and Technology. The factory itself is also reminiscent of the “green hour” – but only as far as the decor is concerned, of course. The drink shines greenly from bottles shaped like pharmacy bottles – inspired by the original use of absinthe as a remedy. “On their final way to the cases, each of the filled bottles is turned into a unique item,” says Frank Kwapulinski. Skilled hands complete the final touches, including tying on a strip of hemp. After the last check has been carried out, the bottles are finally sealed and packed into various gift cartons. “Drink in moderation” advises a logo on the packaging. “We are a member of the Federal Association for the German Spirits Industry and Importers,” says Frank Kwapulinski, adding that the “Abtshof“ works together with the association to promote a responsible attitude to alcohol, without condemning this part of our culture. On the subject of lifestyle: In the 1920s, artists and writers discovered the “green fairy” as their muse. Authors like Ernest Hemingway, Edgar Allan Poe and Oscar Wilde indulged in the drink. Painters such as Vincent van Gogh, Viktor Oliva and Edouard Manet sought inspiration in it. But widespread, long-term absinthe consumption soon led to a transnational ban on the spirit. “When we found out by coincidence that this ban had been lifted in 1998, it gave us a daring idea: We wanted to help bring about a renaissance in this legendary drink of artists,” says company spokesman Mager. “Abtshof” made absinthe widely acceptable again. It is currently very fashionable with young and old, in cocktails, on desserts and over ice cream. “‘Absinth 66’ is the Germany-wide number one on the absinthe market,” says the company spokesman. To establish their market leadership, the long-established company from Saxony-Anhalt took an innovative approach: In addition to the classic made of wormwood, aniseed, fennel, melissa and coriander, there is a yellow version with vanilla flavourings and a red one with a hint of tonka bean essence. This fruit from South America is currently a fashionable spice in upmarket cuisine, says Helmut Mager and adds with a wink that the brown beans are credited with a mood-lifting or even aphrodisiac effect. Has there already been customer feedback on this score? He smiles and says nothing. The “Abtshof” is causing a lot of talk, however, with a new item under the house brand 66: “Buffalo Grass Gin”. “Our company was really brave to try to fit in among the German gin manufacturers,” emphasises Helmut Mager. After two years on a test market, it is currently being launched on the national market. “‘Buffalo Grass Gin 66’ is not rocket science to manufacture, but it is a complex process,” says Helmut Mager and enumerates the ingredients that the gin is composed of: Juniper, coriander, wormwood, lemon and orange peels are in an elaborate and secret multi-stage maceration process with the original bison grass and then distilled. If this makes you curious, you can look forward to more interesting new items from the specialist Magdeburg distillery, promises the spokesman for the “Abtshof”. “This distillate of wormwood was manufactured for the first time in 1779,” says Helmut Mager, telling of the herb women in Switzerland while he walks over the tradition-steeped company grounds in the state capital of Saxony-Anhalt, Magdeburg. Here, on the site of a steam beer brewery founded in 1864, a vineyard owner from the Mosel founded the “Abtshof” as his sales location in 1924. Only a few years later, in-house liquors and brands were being produced here. Since then, they have been in demand in a wide area around Magdeburg. After the German reunification, the entrepreneurial family Nissenbaum from Konstanz and a management buy-out from Magdeburg together pressed ahead with the privatisation of the business and founded Abtshof Magdeburg GmbH in 1992.